Have you ever wondered if your pup is a pure-bred, or what breeds your mutt is made up of? If so, then you’re in luck! Thanks to recent advents in technology, pet owners can find out the lineage of their dogs. With this information, you can learn so much about your furry friend, including what you can expect about his personality and any inherent health conditions that he may be prone to. Since so many pet owners have expressed interest in learning more about their four-legged family members, many manufacturers are producing DNA tests for dogs. Of course, you want the results that you receive to be as accurate as possible, so you’re going to want to invest in the best dog DNA test possible. With the help of a team of professionals, we have scoured the market and found what we believe to be the best DNA tests for dogs currently available. Below, we offer our top picks for the best dog DNA test 2018. Now that you have had a peek at our picks for the best dog DNA test kit, let’s take a closer look at each one. Below, we offer a detailed description of each kit, including the features and what we like about them. Once you have decided which dog breed identification test will best suit your needs, just click on the buttons to find the best prices available on Chewy and Amazon. 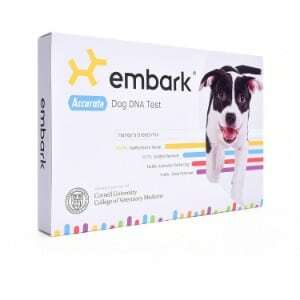 First up on our list for the best dog DNA kits is the Dog DNA Test Kit from Embark. The makers of this genetic testing kit pride themselves on offering the most accurate results possible, and their accuracy has been confirmed by the more than 560 people who have reviewed the product on Amazon. To find out your pup’s lineage, all you have to do is swipe a quick swab of the inside of his cheek, and then send it out to the company. Embark will then test the DNA that was collected on the swab and compare it to the database of more than 175 dog breeds, which includes some of the most popular breeds, such as German Shepherds, Pugs, West Highland White Terriers, and Rhodesian Ridgebacks. Their database also includes coyote, wolf, and even village dogs! Their database is comprised of more than 98 percent of the American canines. Embark’s Dog DNA Test will identify the breeds of your pup’s maternal and paternal bloodlines, all the way back to his great grandparents! In addition to checking DNA, Embark also tests for more than 160 health conditions, making this one of the most comprehensive dog genetic testing kits available. With the information obtained from this dog DNA kit, you will be able to find out more about your pup so that you can provide him with the very best of care. To certify their results, the Embark has joined forces with Cornell University Collect of Veterinary Medicine and is certified by the Orthopedic Foundation of Animals. This dog DNA kit is trusted by professional dog breeders and veterinarians alike. It offers more than 20 times the genetic information than other tests on the market, making it truly a best dog DNA test. Conclusion: While the Embark Dog DNA Test may be more expensive and it might take a while to get the results back, it’s definitely worth the cost and length of time if truly accurate results are what you are seeking. Discover what breed or breeds your dog is made up of with the simple Wisdom Panel 3.0 Breed Identification DNA Test Kit. This dog DNA test utilizes the most precise dog breed identification methods that are currently patented. It will test more than 250 breeds and varieties, which is the largest amount offered by any DNA test currently available. And, 99 percent of the breeds that are tested for are on the AKC registry, including Rottweilers, Yokshire Terriers, Poodles, Mastiffs, and more! 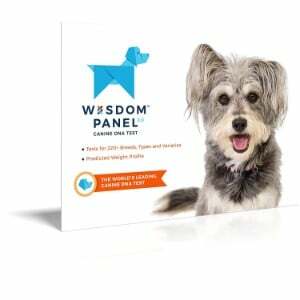 The test algorithm used by Wisdom Panel 3.0 Breed Identification Test Kit conducts more than 17 million calculations in order to offer you the most accurate and detailed information about your dog’s lineage. You can learn about your dog’s history as far back as three generations! The makers of this dog DNA testing kit have partnered with reputable scientists, researchers, and universities from around the globe to provide the most accurate results possible. And, they offer results in as little as 2 weeks! If you have any questions about the results that you receive, you can contact their customer service department, who will gladly assist you. Conclusion: The fast results and affordable price of the Wisdom Panel 3.0 Breed Identification DNA Test Kit, you can expect to learn a great deal about your pet’s history. While some users have questioned the accuracy of the results, it could be due to errors made while collecting DNA. IdentBreed claims that is it the most complete dog breed test on the market, and judging from the reviews that users have shared and the information that our panel of experts has provided us with, it seems that their claims are definitely founded. With IdentBreed, you can find out information about your dog’s lineage by simply taking a quick swab of his cheek and sending it into their lab. They will perform a complete assessment of the DNA you send in, testing it against a comprehensive database of dog breeds, checking for more than 160 health conditions, and also checking for environmental and food intolerances that dogs commonly suffer from. Additionally, this dog DNA test will provide you with information about your furry friend’s stress level and temperament, as well as his overall health and well being. According to the users of IdentBreed dog DNA test, the results that this test provides appear to be quite accurate. Users have said that they liked how easy the test was to use and they were pleased with the information that they received. 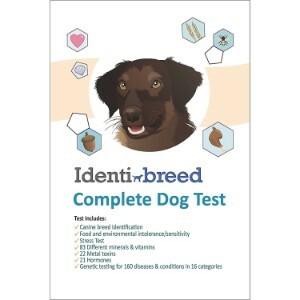 Conclusion: If you want to find out the truth about your dog’s history so that you can provide him with the very best of care but you don’t want to invest a tremendous amount of money, IdentBreed: The Most Complete Dog Breed Test is a great option to consider. Wisdom Panel offers such an effective dog DNA test that we have decided to offer not one, but two of their products on our list of the best dog DNA test reviews. 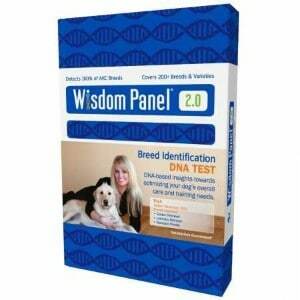 The Wisdom Panel 2.0 Breed Identification DNA Test Kit is a bit more affordable than the Wisdom Panel 3.0 Breed Identification DNA Test Kit, but the results that it provides are just as efficient. To learn about your furry family member’s history, simply take a quick swab of his cheek and send it into their lab. They will test the DNA that you provide them with against their large database of breeds, including some of the most popular breeds in the United States. Not only will they find out about your pooch’s lineage, but they will also uncover insights about his behavior and wellness, too. After completing their extensive testing, they will send an official Ancestry Report directly to your email, which will highlight all of the information that their tests revealed. You will learn about your pooch’s history all the way back to his great grandparents! You’ll be able to use the information obtained from this report to provide your pup with the best care possible, ensuring his health, safety, happiness, and overall well being. Conclusion: The Wisdom Panel 2.0 Dog DNA Test kit is more affordable than the 3.0 kit offered by the same company, and even though the results aren’t as comprehensive as the 3.0 version, they can still provide you with valuable information about your best friend. Some of the best dogs in the world are mutts, but if your pup is a mixed breed, it can be hard to figure out what his needs are. Why? – Because unlike pure breeds, it can be hard to tell what is nutritional and health needs may be. But thanks to the Mixed Breed DNA Test Kit, also from Wisdom Panel, you will be able to find out more about your pooch so that you can provide him with the best care to meet his needs. 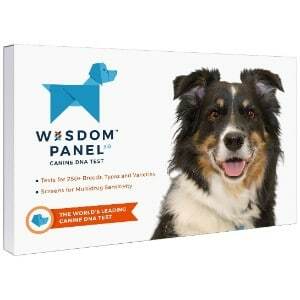 The Wisdom Panel 2.0 Mixed Breed DNA Test Kit works much like this manufacturer’s 2.0 and 3.0 dog DNA test kit; simply swipe a swab along your dog’s inner cheek and send it out to their lab. The company will then test your pup’s DNA against their large database of dog breeds to find out his lineage. Once the test is complete, the will email a report that highlights information about the breeds that your furry best friend is made up of. With this information, you will be able to customize a nutritional, exercise, and health plan that will meet his unique needs. What sets this dog DNA test apart from other kits on our list is that it is made specifically for mixed breed dogs. The DNA testing is very limited; the database that the DNA is tested against isn’t as large as the 3.0 and 2.0 Wisdom Panel Dog DNA Test Kits. It doesn’t test for any specific genetic markers that relate to health conditions. Conclusion: If you have a mixed breed pooch and you want to find out more about his history and what he’s made up of, than the Wisdom Panel Mixed Breed DNA Test Kit can be a very useful tool. It’s fast, affordable, and from what we can tell, it offers accurate results. Being a pup parent is a big commitment. Just like a child, your dog is counting on you to provide him with the very best of care. In fact, without you, your pup would not be able to thrive. When it comes to caring for your pet, there are a lot of things that are common knowledge and apply to all pets. For example, the type of dog bed, dog crate, dog house, dog playpen, or outdoor dog kennel you use with your pup isn’t breed specific; as long as these products are high-quality and offer features that will keep him safe and protected, you can purchase pretty much any product. The same is true for other products, like an automatic dog feeder, a dog food container, a dog gate, and even grooming products, like a dog brush, a dog shampoo, and nail clippers for dogs. However, there are some things that are more specific when it comes to caring for your dog, and these things can vary from breed to breed. Caring for a pup without knowing exactly what his genetic background is can be hard. But with a dog DNA test kit, you can learn more about your pup so that you can provide him with the best care possible. If you’re wondering why a dog breed identification test kit is a wise investment and how it can benefit you and your pup, keep on reading to find out some valuable information about these tools in the buyer’s guide portion of our review. There’s a lot of information that you can learn about the furriest member of your family from his DNA. Not only does it let you know about your dog’s lineage, but it will also provide you with pertinent information that will allow you to provide him with the best care possible. Understand health needs. Many dog breeds are predisposed to certain health conditions. For example, Labrador Retrievers are prone to skin problems, like dermatitis, and Siberian Huskies are prone to hip and elbow dysplasia. By having a better understanding of your dog’s health, you will be able to know what his chances are of developing a certain condition. With that information, you can devise a plan so that you can help him avoid developing such issues, or you won’t be taken off-guard when they arise. For instance, if a genetic test reveals that your dog is part lab, you won’t be as surprised if he develops skin problems and can purchase medicated shampoos for dogs that will help to treat the problem. Understand nutritional needs. Genetic information will also allow you to better understand the nutritional needs of your pooch. Generally, most breeds do share common nutritional needs; however, some breeds require more or less nutrients than others, and some should stay completely away from certain ingredients. With that said, if you acquire his genetic information from a dog DNA test, you can customize a diet and provide him with the best dog food that will meet his unique nutritional needs. Understand his temperament. If you’ve ever wondered why your dog jumps so much, gets scared so easily, or digs incessantly, believe it or not, genetic testing can help you better understand his disposition. Dogs are bred for specific purposes, and those purposes can be seen in their disposition. For example, Boxers tend to paw a lot (hence their name) and Westies tend to chase small animals. Why? – Because they were bred to do things that require these behaviors. If you understand your pup’s disposition, you will be able to purchase a dog training book that will help you learn how to successfully handle his behavior. There are many different DNA tests for dogs on the market today, but they aren’t all created equally. If you want to get the most accurate results and find out the most pertinent information about your pup, you are going to want to invest in one of the best dog DNA kits available. Ease of Use. A high-quality DNA testing kit for dogs should be easy to use. Some kits require you to actually draw blood from your pup, which can be an unpleasant experience for both of you. However, a quality test will only require a simple swab of the inside of your dog’s cheek. You obviously want to receive the most accurate results possible. Some tests claim to offer accurate results, but in reality, they are more made up than real. A truly effective test will deliver highly accurate results. Large testing database. The best DNA testing kits for dogs will compare your pup’s DNA against a large database of breeds. Additionally, they will test for more than just your pup’s lineage, but they will also check for health conditions, allergies, and other pertinent details that will help you provide better care for your pup. Satisfied reviews. You can learn about a product from the reviews that users provide. High-quality, accurate DNA tests will have offer reviews from satisfied customers. By taking the time to really research, you will be able to find a dog DNA test that offers the most accurate results about your furry best friend. Your dog is more than just a pet; he’s your best friend and a member of your family. Just like you would want to know as much as you can about a human best friend or family member, it makes sense that you would want to know as much as you can about your pooch. With the best dog DNA test, you can find out pertinent information about your pop. This information will not only help you better understand your pooch, but it will also help you provide him with the very best of care.